^ a b c W. Christopher Wozencraft, "Martes". Mammal Species of the World, (3rd ed. ), Don E. Wilson & DeeAnn M. Reeder (ed. ), Johns Hopkins University Press, 2005, pp. 608-611. 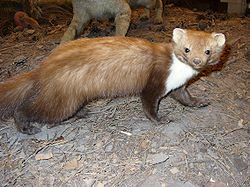 ^ a b c d e f Klaus-Peter Koepfli, Kerry A Deere, Graham J Slater, Colleen Begg, Keith Begg, Lon Grassman, Mauro Lucherini, Geraldine Veron, and Robert K Wayne, "Multigene phylogeny of the Mustelidae: Resolving relationships, tempo and biogeographic history of a mammalian adaptive radiation", BMC Biology, Volume. 6, No. 1, 2008, pp. 10-22.